Silvio Berlusconi's wife has written a public letter to the newspaper asking her husband to apologise to her for chatting up other women at a recent event, "not having received one privately". Go girl! Though I'm not sure I would really advise marrying Berlusconi in the first place. But apparently in a recent interview he praised her for being "lenient"; I'm not sure he will now feel the same way. We went down to Pallant House in Chichester last weekend for the opening of their new exhibition of William Roberts paintings, and to snoop around their new wing, designed by Long & Kentish with MJ Long's life partner Colin St John Wilson as a collaborator. Sandy Wilson, as he is universally known, is best known as the architect of the British Library, a magum opus that took up virtually his whole working career. He recently donated his fantastic 20th century British art collection to Pallant House, and the new wing is great, with a lovely courtyard cafe. Pallant House has a really interesting history, founded as a gallery when the Dean of the cathedral donated his collection to the city and demanded that they house it in a rather magnificent Queen Anne town house right in the centre. Now about three times larger than the original house, it has an impressively serious collection and programme, really positioning itself as a resource for the town and truthfully rivalling many more metropolitan institutions. It has a proper library and education programme and, in a lovely touch, the reserve collection is shown publicly, hung on utilitarian rails around the walls of the lecture room. It is here that one finds the subject of my photo: a wonderfully eccentric series of architectural models of the gallery, filled with miniature works of art. Their history is peculiar: in 1934 an Sydney Burney, an art dealer and patron, wanted to raise funds for the blind, and decided to create a mini museum in which mini works of art by artists of the day should be exhibited. 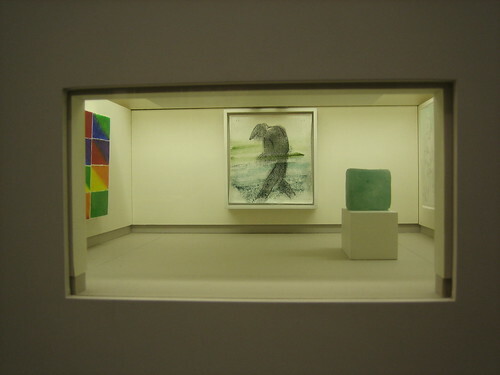 The result, a scale model interior stocked with little pictures and little sculptures, would be placed on public display. He managed to persuade the likes of Paul Nash, Henry Moore, Augustus John and Barbara Hepworth to contribute work and the end results are absolutely enchanting with some genuine miniature masterpieces. What is particuarly sweet is that, to surprise St John Wilson, Pallant House commissioned new models, at the same scale, of some of the rooms in the new wing and stocked them with new miniature artworks from some of the artists in his collection. I can't really think of a more touching tribute to the man and his contribution to Chichester. Last night I went to a preview of The Atheist, here on its UK premiere after having been performed off-Broadway. Excellent, rhythmic writing from Ronan Noone, excellent one-man performance from Ben Porter, directed by my old friend Ari Edelson. But despite the connection, definitely worth seeing. It's the self-told story of a tabloid journalist in the States, whose fierce lust for fame and rejection of God bring - well, is it amorality? The post-show Q&A was good on this, topical in these days of the Big Brother controversy. Particularly when the writer (who lives in the States) told a great story of switching on the TV late at night in the friends' flat he is staying in here, to see grainy, dark pictures of two girls snuggling up together and thought his play had come to life. I won't tell you more in fear of spoilers. Every series of BB has impacted on the question of bullying, with claiming past bullying having been virtually a calling card of participants. Jade Goody even represented a bullying charity until they dropped her this week. But the real nature of bullying, discrimination and the group mentality that underlies them has never been examined in such detail as now, when white female contestants are accused of racist bullying of the Bollywood star Shilpa Shetty. India's foreign ministry is probing the allegations and likely to make an official statement to the UK, while Gordon Brown is currently on an official visit to the country. There are reports of effigies being burnt on the streets and Bollywood filmmaker Mahesh Bhatt is quoted by Reuters as saying "What is happening on Big Brother is just holding the mirror to the western society. This is the real, discriminating face of the West you can see on the streets of London or New York." The racism row has boosted flagging ratings by a million viewers. Motions have been called in Parliament and Tony Blair has been forced to comment. As the Guardian points out, racism in the infamous House is nothing new. But this systematic, group bullying has certainly taken it to a new level, and by doing nothing, Channel 4 are perceived to condone it as part of the goldfish bowl concept. Perhaps this is right: let it go far enough that on exit, guilty housemates can be hauled up in court on the Race Relations act? Teddy Sheringham's beauty queen lover? (It seems that C4 have now given her a warning, so this is now unlikely to happen.) I would like to see West Ham fans react to that: and they will probably defend her. Because unfortunately it is true that a mirror is put up to our society. We are all a little bit racist, as the satirical musical Avenue Q put it. We are herd animals, grouping together, finding patterns, genetically programmed to notice differences and nurtured in a culture that can never become colour-blind, or class-blind. But unlike that song, which sent up our differences, and therefore sensitized us to them, we haven't learnt to deal with this fact of humanity in a positive way: by pretending it doesn't exist we repress it, and react with outrage if someone dares to suggest that it still exists. I just wish that instead of manifesting itself in violence, threats and riots, we could, for once, have an honest examination of our racist feelings. But that is hoping too much of a country which creates celebrities out of monsters like the Goody mother and daughter, and that creates those monsters in the first place, through our appalling approach to sink estates, victim to our class 'racism', no matter what the political rhetoric says. Apparently it is Frei Otto for the next pavilion. But I was a bit surprise by this as although technically it may be his first project in the UK (all the pavilions are done by those who have never built here before) he has actually done a building in Britain - the workshop at Hooke Park, formerly John Makepeace's wood research campus in Dorset and now belonging to the AA. He collaborated with ABK and Buro Happold to create the Workshop, which experiments with bending greenwood and carrying loads across large spans on small-diameter roundwood beams, and the Refectory, which is meant as a prototype for a house, in which the structure hangs like a tent on four A-frames. But the Workshop is definitely considered one of his important works. Still I'm a big fan of his experimental and construction-led approach, so I can't wait. Especially after the downer of Rem's attempt last year. Yet again, in band practice this evening I was asked if, really, wouldn't I sing just a bit? I answered, as I always do, that no, I have a voice like a crow and haven't sung in public since I was around 11 and in the school carol service. But singing is in the news rather a lot at the moment, what with funding announced specifically to get kids in schools to sing more. And as this commentator says, why stop there? don't we all like singing, secretly, even if we think we are terrible at it? It is relaxing, cathartic, healthy. I'm sure one of the reasons I love going to the Arsenal is because I get to sing at the top of my voice with lots of other people and no-one worries about their vocal qualities. As Liverpudlians will say there is no greater sound than the Kop choir singing 'You will never walk alone', I will claim there is nothing that equals the Arsenal 'library' suddenly roaring to life as a chant starts up and ripples round the ground until in seconds the whole place is magnetically alive with sound. And even in my own home, if there is no-one around, I will attempt to pathetically sing a few notes along to the guitar I am currently trying to relearn or, even worse, to my guilty musical pleasure of early Britney Spears, to the torture of the boy. Yet put me in a karaoke-like situation and I run a mile, let alone on stage where I stubbornly stay mute. There have already been threats by the band to force me to get over it. I'm terrified, but somehow secretly, I can't wait. This article (on the generally patchy Comment is free 'blog' - 5000 word pieces are NOT blog posts, guys) addresses the massive and hidden poverty of the USA, which I saw first-hand and was shocked by in Alabama. Apparently around 25m Americans are dependent on charity food banks to stop them literally going hungry, and a further 13m are going hungry and aren't yet plugged into any support network. This being the States, of course there is no state help for the poor. The federal minimum wage is still stuck at $5.15 an hour, as it has been for the last ten years, meaning that if you worked full-time you would still end up with less than $10,000 a year. The degrees of poverty that exist in the States are truly shocking - in Alabama, not only the traps of low wages, disability and ill health, but shanty town housing of shacks with no sewage systems, resembling more the photos of Africa than what you would expect of the world's richest nation. Indeed, at one point early on in The Last King of Scotland, when a packed, rickety bus pulled up in a small Ugandan town, I whispered to the boy that it looked just like Greensboro Depot St.
As the author of this photo series says "The roadside bus stop serves a simple purpose – to show where the bus will stop and to provide some comfort and shelter for waiting passengers. 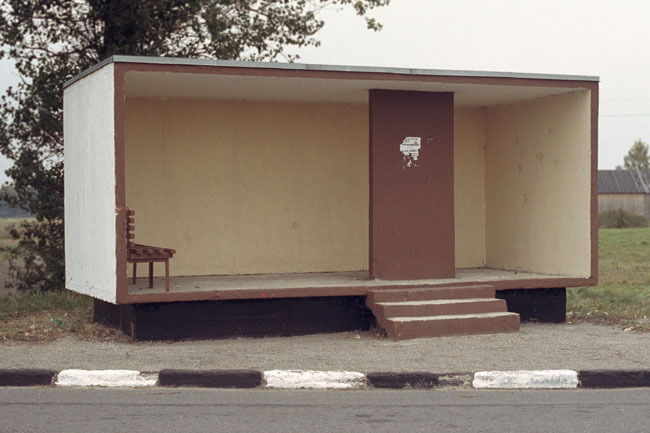 One would think that the Soviets would have come up with one universal design for this community structure – simple, functional and cheap to mass produce." 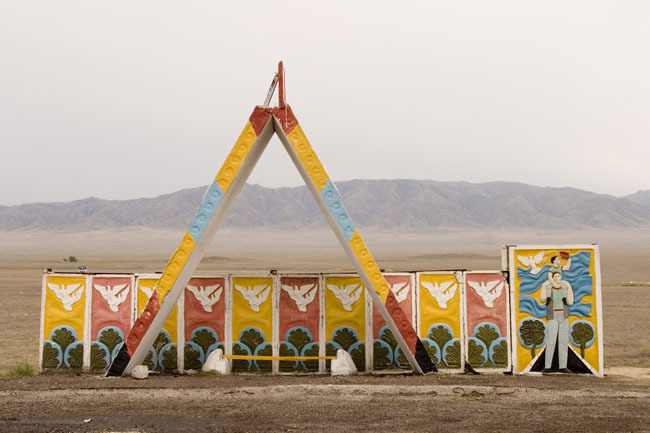 But no: he shows a series of fantastical, figurative and folly-like designs from all over the former Soviet Union, some of which look like first-year architecture projects, and some of which like small temples. This video of DJ Eric Prydz's remix of Pink Floyd's track Another Brick in the Wall is doing the rounds: chiefly because of its loud-and-clear environmental message. He says a bit about his ethics and ideas here in an interview. Extraordinary to read today that by 2020 China will have around 30 million more men of marriageable age than women. According to the State Population and Family Planning Commission this may lead to social instability, which seems to be an understatement. The mind only boggles at 30 million single men running around and what that will result in. Around 118 boys are born for every 100 girls in China at the moment. And the number of 60-year-olds and over will jump from the current 143 million to 430 million by 2040, 30% of the total population. Of course, it had to happen this way - because it always does. Whenever I buy a new gadget, it always seems to be just before MacWorld, when Apple brings out something that makes me immediately want to throw all my money at them and buy another one. So I bought a new iPod to replace my old broke one, and I went freelance and celebrated by getting myself a BlackBerry (ugh, I know). So this was therefore preordained to be the year when all those iPhone rumours really came true at MacWorld - and they did. And I am a slave to Apple, but I love it and want it now. IT IS PERFECT. When can I give you my money, Steve? does it work in the UK? 'Visionary'" Bruce Sterling and Jon Lebkowsky (WorldChanging guru among other hats) about what the new year holds. A bit like eavesdropping on a really interesting conversation at the table next to you, it is raising some provocative points.